My Race Ragz – Review and Giveaway! What would you put on a running shirt if you were inventing your own? Turns out mine would be vaguely sarcastic. Imagine that. My Race Ragz lets you choose from about a ton of pictures and sayings, or you can create your own. 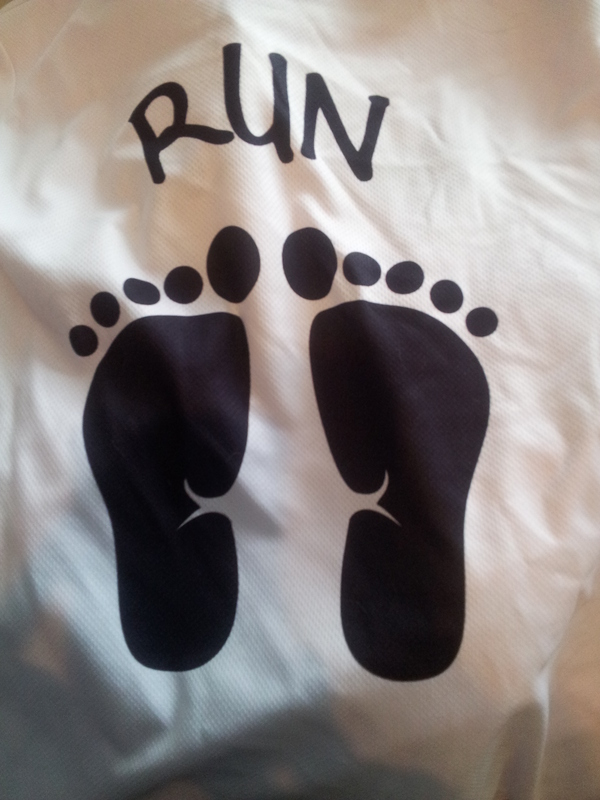 They have motivational, funny, and even some for barefoot runners! I haven’t been able to try my shirt out on a run since I haven’t been feeling well (and as you can see I used that excuse to not hang up my laundry too…) but I wore it around anyways and I absolutely love it. Their shirts are really comfortable and shaped to fit nicely. I ordered a size up and I’m glad I did – I would definitely recommend you do the same if you order one of their shirts! I believe they only have white colored shirts, but the graphics can be most any color you’d like. I actually chose black. I know, how boring I must be. But I like it! Enter below to win, and go ahead and make your shirt all kinds of colorful and you! You have until 7/25/2014 to enter; the winner will be emailed the following weekend. Oh, and since you can personalize these with your own saying you don’t have to run to love one of these shirts! This entry was posted in giveaway, Running by Kinda Zennish. Bookmark the permalink. I like the Run Forest, Run predesigned church actually. I hope I get to make a shirt! !! Hard to choose with so many possibilities! I like the stick man running. I’d love to get something with “miles to go” on it. I’ve always loved the Frost poem this comes from and it’s even more fitting since I’ve started running. I’d put “Jess Run It” the name of my facebook page! My heart says run, My body says sleep. I’m honestly not sure yet – probably something Disney related! ‘Chrons won’t defeat me!’ or something like that! I am not sure.. 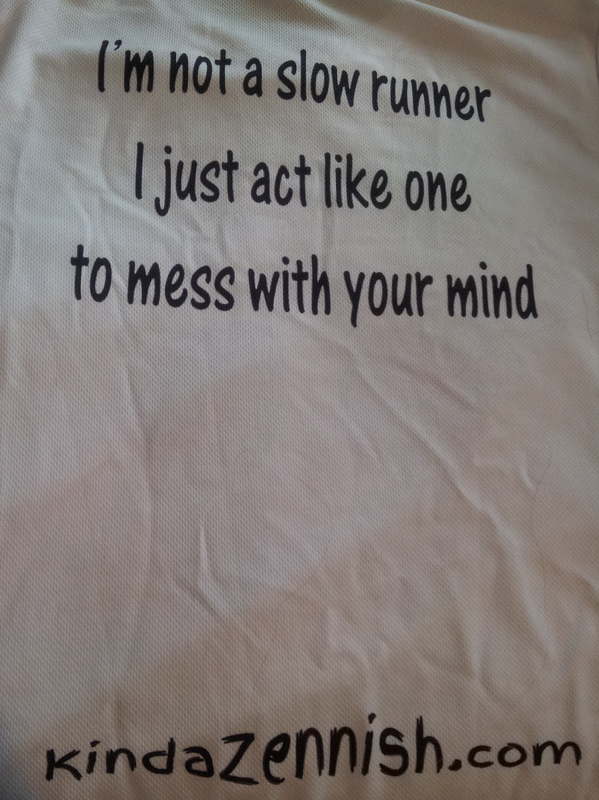 I like the example one about being a slow runner to mess with mind…. Oh something 26.2 Related for my first marathon in January…WHAT DID I SIGN UP FOR? I’d love to get one with my blog name “Cook and Run with Kristin”!! I feel ya on not running much lately – it’s so hot in Phoenix that I can’t make it work! I have friends getting up at 4am, but that’s really really difficult for me lol! love the slow runner sayings. I would do something like that. Probably the “I’m a Runner 10K” one since I’m about to do my first. Or maybe a design with my FB/blog name.